I’ve started a worm bin few days ago. 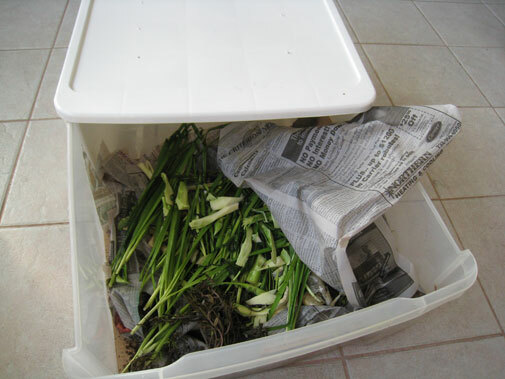 A worm bin can help me compost kitchen scraps and reduce the amount of garbage I produce. My goal is to grow my own food and help reduce greenhouse emission…sounds ambitious? Just a little. Red wigglers are the common worms used to produce vermicompost; it is the end product of breakdown of organic matter, such as food in my case. Please read on on building an indoor worm bin. 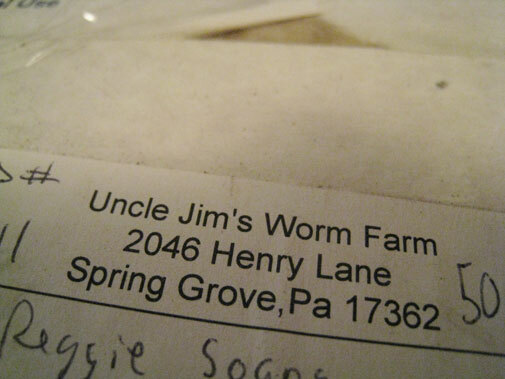 I ordered my worms from Uncle Jim’s worm farm. They ship your worms on Monday and they arrive your house within few days via USPS Priority. 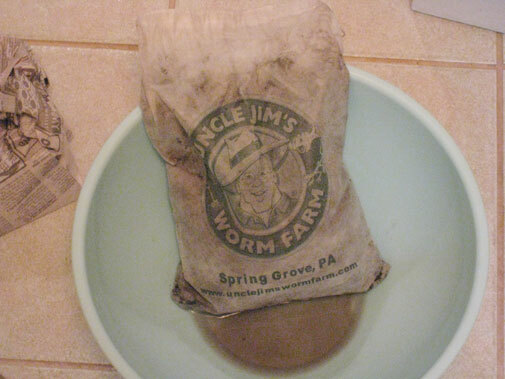 The worms come in a small duffel bag with your worms and moistened soil. But the worms need to be watered immediately. 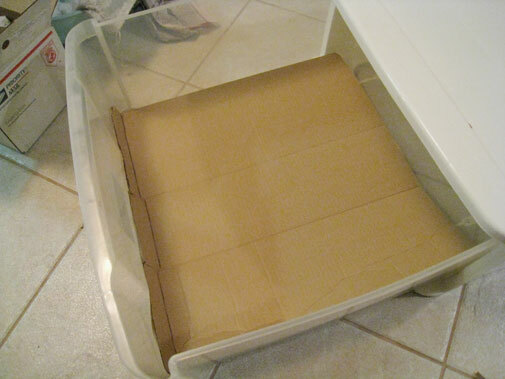 Any household plastic containers can be used to build a worm bin. 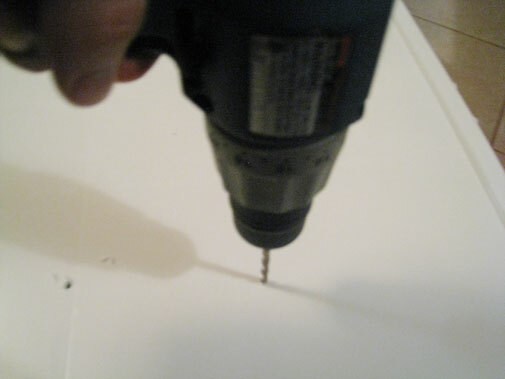 Drill some holes on the top (worms have to breathe, too) and make sure the lid can cover the container completely. Fit a cardboard into the bottom of the bin. 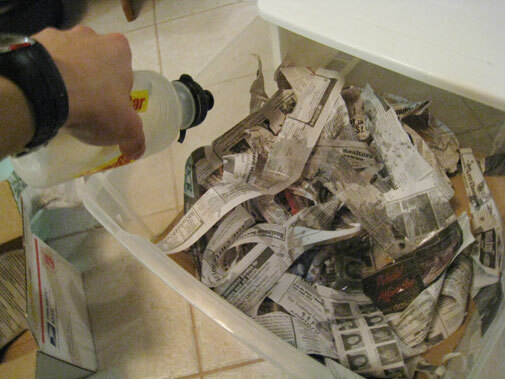 Shred some newspaper (or any used paper) and squirt water all over inside the bin generously. 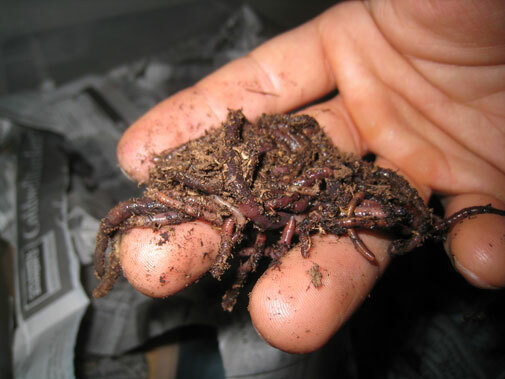 Worms like their bedding wet and cozy…they are very slimy after all, but don’t drown them! Believe it or not, one of those little worms can consume the same amount of food as its body weight in 24 hours (imagine we consume the same amount of food as our body weight everyday)! I fed them chives, fennel, garlic peels, and savory (a type of herb) for their first meal in my house. 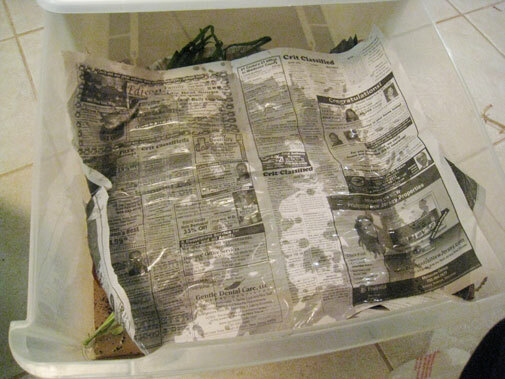 Last step, cover the whole bedding with wet newspaper to keep the worm bin moist. The manure, vermicompost, produced by worms is rich in nitrogen, phosphate, and potassium; they enhance the quality of soil and provide excellent organic fertilizer. Not only does having a worm bin produce great soil for plants, but it also cuts down the amount of garbage produced. Start this spring by making yourself a worm bin and harvest unlimited amount of tomatoes by august! I have been vermicomposting for over a year, and you’ve done a phenomenal job of showing the steps of setting up a worm bin. The photography throughout your blog is outstanding- very impressive!